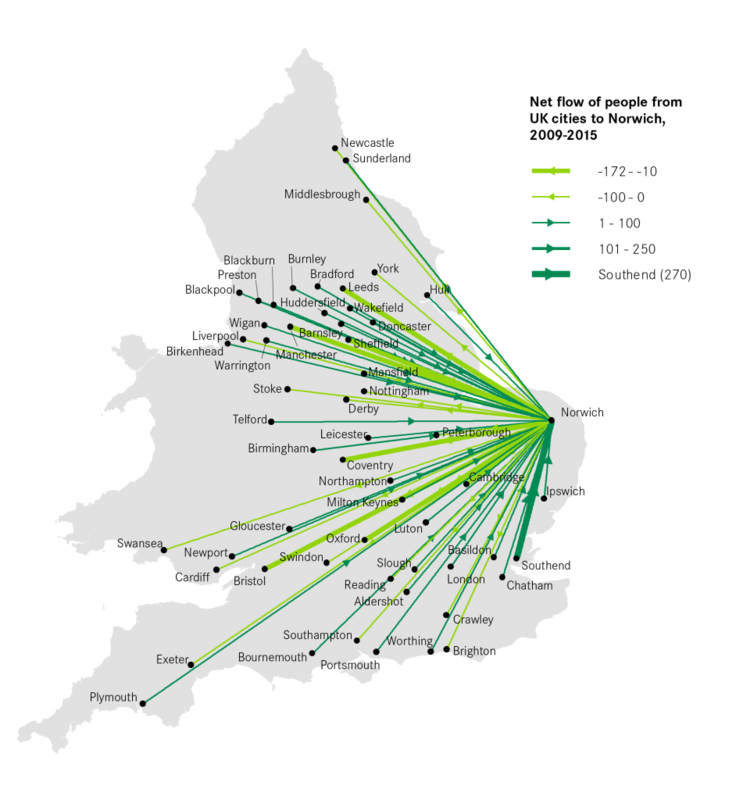 What are the overall migration patterns of those moving into and out of Norwich, and what are the movements of students and graduates? The economic performance of UK cities is increasingly dependent on the skills of their workforce. Cities across the UK face the challenge of both attracting and retaining high-skilled talent. The Great British Brain Drain investigates migration within the UK, specifically between cities. 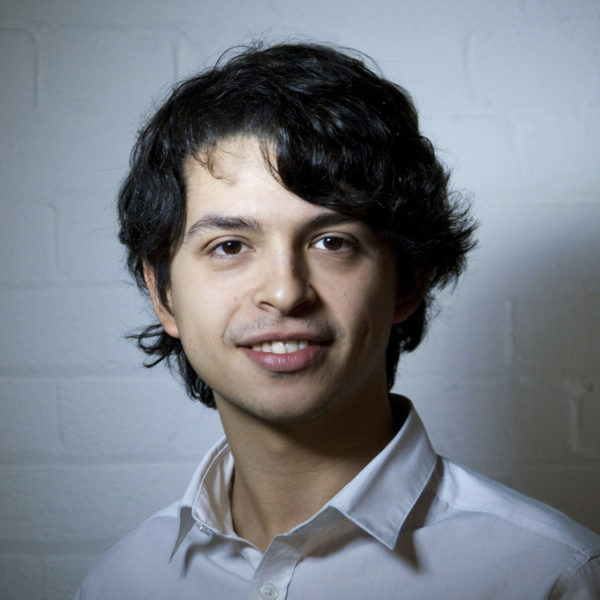 It finds that many university cities lose their graduates to London, with this movement especially strong for the highest performing graduates with 2.1 or 1st class degrees from Russell Group universities. Despite this, most university cities experience a ‘graduate gain’: they gain more graduates than they lose. This is because the majority of movements to and from cities consist of students moving to a new city for university, and then moving again for work, with over half of all graduates following this pattern. This briefing is a complementary piece of analysis to the main report, in which we look in detail at the nature of migration and graduate mobility into and out of Norwich First, it looks at overall migration patterns into and out of Norwich. Secondly, it looks specifically at the movements of students and new graduates. Finally, it looks at the new graduate labour market in the city. Norwich’s migration patterns are dominated by movements of university students and young graduates. There was a large net inflow of young people moving to the city for university, and the largest net outflow occurred as 22 to 30 year old degree-educated residents left the city. Most of these migration flows were between Norwich and the rest of the East of England. Overall Norwich gains graduates. The inflow of students moving to study in the city’s higher education institutions was followed by an outflow of new graduates. But these movements mask the underlying trend of Norwich gaining graduates. While many people who had come to study left upon graduation, some remained and others have come to Norwich to work. This increased the number of degree holders working in the city. But its ability to attract new graduates is limited by the lack of job opportunities. Norwich has the lowest wages and the lowest share of new graduates working in high-skilled jobs among UK cities. This lack of opportunity in higher-skilled or ‘graduate’ jobs is likely to be an issue in its ability to attract and retain the best graduates in the future. To increase the number of graduates working in Norwich, be they from its universities of from elsewhere, the city should focus on improving the local economy. 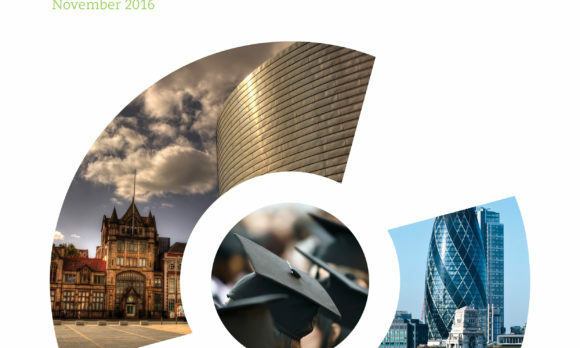 Many policies looking to increase the number of graduates in UK cities in the past have tended to focus on increasing graduate retention. But job opportunities are the big driver of graduate moves. This means that policies designed to increase graduate attraction and retention should focus on wider economic development policies that attract business investment in high-skilled jobs. If this occurs, then it will increase the attractiveness of Norwich to graduates. This report has kindly been supported by The University of East Anglia.